Get everything you need for your retail store in one place. 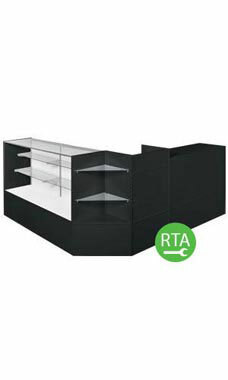 The Black Display Case Arrangement allows you to purchase essential display pieces together to create a custom built-in unit that will give you years of affordable dependability for your retail store. The Display Case Arrangement includes one of each of the following: 70"L Full Vision Display, Open Shelf Corner Filler, Well-Top Register Stand, and 48"L Service Counter. Our display case offers a variety of affordable features, including a low pressure melamine laminate finish with tempered glass top, front and sides. Additionally, it contains sliding rear hardboard doors and anodized aluminum frame extrusions. Ready to assemble and available for immediate shipment, our display showcase arrangement will provide your store with all of the proper pieces to display your most precious merchandise. I ordered 2 of these units and both arrived with all broken glass pieces. Once the glass was replaced the unit was easy to put together and a nice sturdy unit. However, the screws used to mount the shelves to the unit are not strong enough, they strip and cause the shelves to fall when product is placed on them. I ordered this unit for my new store. I like the storage and it works well with my square stand and cash drawer. I was referred by another store and would recommend you to others. I see several items in your catalog that I want to add as my budget opens up. These are good and it was even better they arrived assembled. Our display combo arrived on time but the glass was broke. We called customer service and they replaced it and shipped a new one and it arrived the next day. Customer Service is wonderful, prices are fair, and our display case is of good quality.We will buy from them again! These are probably one of the best value systems around. Easy setup and was ready to go in no time. Get this and have your display/cash register area ready for anything. I almost spent the 30 bucks per piece to assemble but I'm glad I didn't. Most of the pieces where already in place. All I had to do was snap them together, it took me a total of 2hrs to assemble. It looks great and very durable. You won't find a better deal.